Join the discussion on our forums! Come discuss Mistwraith over in our dedicated Mistwraith discussion topic. Whenever you play an Echo_card, gain +1/+1. One little Mistwraith sitting in a tree. M-I-S-T-I-N-G. I see some interssting synergy with Pickpocket,Spectral Cutlass, and Tess Greymane. Very similar, but worse, than Questing Adventurer. Not sure if there will be enough echo synergy for this. It may not fit into many constructed Rogue decks, but it's a strong card, especially if there are a lot of good echo cards. 3/5 is already a good stat line because a 5 health creature is difficult to deal with for most classes. It might be a decent midgame minion for rogue. Definetely worth trying at least. On the plus side, his statline is decent enough to be played on curve without the need to immediately activate his ability. It's very interesting, and could be valuable if it survives after the turn it was played. Most Echo cards have pretty low costs so this could work. Card text is a worse version of Questing Adventurer. However, this card is very different in how it works from Questing. The big difference between the two cards is that Questing is only really playable if you buff him on the same turn. You can't drop Questing Adventureas a vanilla 2/2 on turn 3. However, the Mistwraith being a 3/5 for 4 mana means you can drop it on curve, and have a decently high chance of it surviving. Also, due to having both a high reward for playing Echo cards, and still being decent without the reward, I doubt you'd even need that many Echo cards to justify running Mistwraith. Even a deck that only ran two Cheap Shots and a Face Collector could use it. Sure, 2/3 of the time Mistwraith won't get a buff. 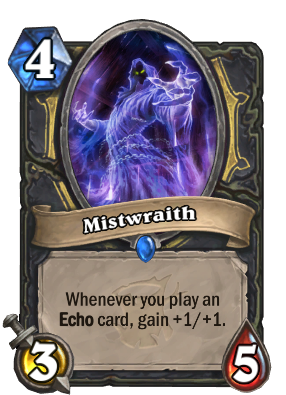 But if you do the math, considering you'll usually play 2-4 echo cards at a time, Mistwraith still ends up being pretty good. I will admit, however, that there is currently no viable Rogue dech archetype which has enough room to play minions that are "simply above average", as they're all heavily focused on synergy. Mistwraith could see play in a more minion-heavy Midrange deck, but considering how many spells Rogue naturally runs, it's doubtful there will be any room for minions played simply for stats. If Echo gets more development this could be okay. Problem is that Questing Adventurer gets buffed by all cards including echo cards, so is a way better option if you want this effect. The text says gain +1/+1 but the art says destroy the enemy hero. Decent arena card but thats about it. ... or does it ? !